Normally hiking a fire road is not my preference, particularly one that can be driven on. But as I run out of close-by regular hiking trails, I have found some fire roads in the San Gabriels that offer pleasant outings. Rincon Red Box Road (2N24) is such a route. It's only about 20 minutes from my home in Azusa and works well for an after-work summer hike or as a dawn hike on a full weekend. I use it as a good workout. When the marine layer hugs the valley-facing foothills, a short drive up the canyon to Rincon Road can yield a fog-free stroll. 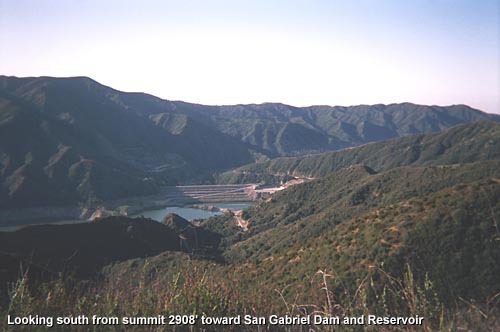 This hike originates from Highway 39 near the confluence of the West, North, and East Fork of the San Gabriel River. The walk ascends Rincon Red Box Road 3.2 miles in a southward direction to a saddle, then goes off road another 0.3 mile climbing a ridge to a nice little summit giving you a sense of destination and some outstanding views. If you prefer a shorter trip, there is a choice turn-around point at 2.5 miles, giving you a five-mile round trip hike. One downside of this hike is that you run a chance of encountering off-road vehicles, which kick up a lot of dust and spoil the solitude of being in nature. But the likelihood of such an encounter is reduced if you go on a weekday or at the crack of dawn or at the end of the day. This hike is almost entirely in the open with little shade. Avoid hiking this trail in hot weather, unless it's at daybreak or sunset, when the surrounding mountains block the sun. I like it best in the spring when the hills are green, wildflowers add a splash of color, and the abundant yellow Spanish broom along the route can be quite fragrant. See Seasons of the San Gabriels for a detailed description of minding the seasons. From Interstate 210 in Azusa, take Azusa Avenue (Hwy. 39) north about 12 miles to the junction at the East Fork Road (8.6 miles from the forest station at the mouth of the canyon). Continue straight on Hwy. 39 and drive another 0.8 mile, passing the OHV area on the right and the Rincon Educational Center on the left. Immediately past the Educational Center is the beginning Rincon Road on the left. A National Forest Adventure Pass is required. 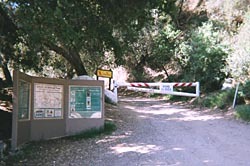 Walk past the locked vehicle gate and begin hiking up the road in a southward direction into Rincon Canyon. You'll soon leave the covering of oaks and bays as the road continues its wandering ascent through rich chaparral. There is lots of robust poison oak enroute, but it shouldn't pose a threat to you unless you hug the road's edge and are not alert to the toxic twigs and leaves occasionally intruding. In the spring some of the blossoms you will enjoy include Spanish broom (yellow), lupine (purple), sticky monkey flower (orange), California lilac, Indian paintbrush (red), mustard (yellow), everlasting (white), California buckwheat (cream), and prickly phlox (lavender). The first mile or so is the steepest part of the hike, then the road mellows out some. As you look up the canyon you can see your route zigzagging far above. Your first couple miles steadily contours along the west slopes of Rincon Canyon with ever-expanding views of the high country to the north. At about 1.7 miles you pass under a canopy of bay and oakthe last tree-provided shade enroute. 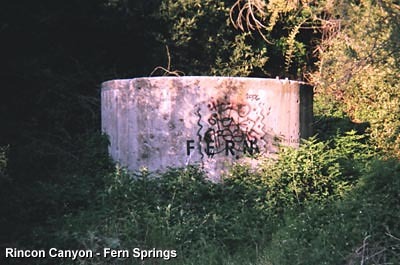 The lush vegetation signals the presence of Fern Springs. But don't plan to top off your canteenthere is no potable water source readily accessible here. In a couple minutes past the spring, the road curves back as it crosses over the canyon's main water course, channeled under the road. In a couple more minutes you pass a 2-mile marker. You are now heading in a northeasterly direction as you steadily ascend the east slope of the canyon. 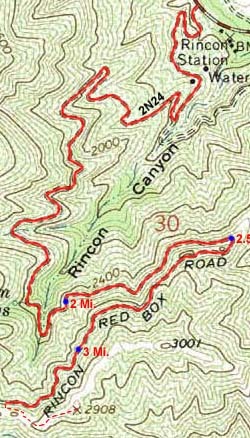 At 2.5 miles you reach a hairpin turn marking the divide between Rincon Canyon and Robbs Gulch. If you would like to make your outing a 5-mile trip, this is a good destination at which to turn around. After the hairpin turn you are now heading southwest. 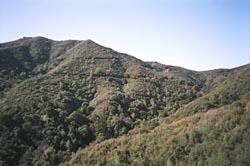 The road briefly travels along the slope above Robbs Gulch, then it passes back to the Rincon Canyon side. After you pass the 3-mile marker you make a final pitch toward the canyon head and saddle. As the road nears the saddle and just before the road begins to curve northwest, look carefully on the left for an off-road spur route to the saddle. You'll scramble up the bank, veer back left, and climb a use path that follows a nearly-vanished firebreak. In about 3 minutes you achieve the saddle and enjoy a view straight down into Polecat Gulch to the south. Once at the Saddle, turn left (east) and follow the faint path. It's a little brushy but I've done it fine in shorts. As the summer wears on, your socks may be a magnet for foxtails. Climb the ridge to summit 2908'. From this vantage point you have striking views. Below you to the immediate south you can see a portion of Hwy. 39 and San Gabriel Dam and Reservoir. 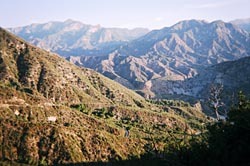 Southeast across San Gabriel Canyon is Glendora Mountain (3322'). To the distant east stands Mt. Baldy and the surrounding high country. The dominant summit to the north immediately across the canyon is Burro Peak (3200'). Further north lays the Crystal Lake basin and Windy Gap with Hawkins Ridge (to the right) and Mt. Islip (to the left). As your eyes pan further left you see Kratka Ridge and Twin Peaks. Your view to the immediate west is dominated by pyramid-shaped summit raising nearly 900 feet higher than your location. Just to its left you get a glimpse of the Rincon Road rounding the southeast ridge of Pine Mt. (out of view). After soaking in the beauty from this splendid little summit, return the way you came. The Rincon-Shortcut Route Off-Highway Vehicle (OHV) Route is a 24-mile dirt route (Forest roads 2N23-2N24), accessible by visitor permit only. The route is recommended only for OHVs, and may be entered from San Gabriel Canyon (Highway 39) on the east, or the Angeles Crest Highway (Highway 2) on the west. It is open year-round except during adverse weather, special events, or wildfires. 110 N. Wabash., Glendora CA 91741, 626-335-1251 8:00 a.m. - 4:30 p.m. Mon.-Fri.
Highway 39 626-910-1235, 8:00 a.m. - 4:00 p.m. Weekends and Holidays. 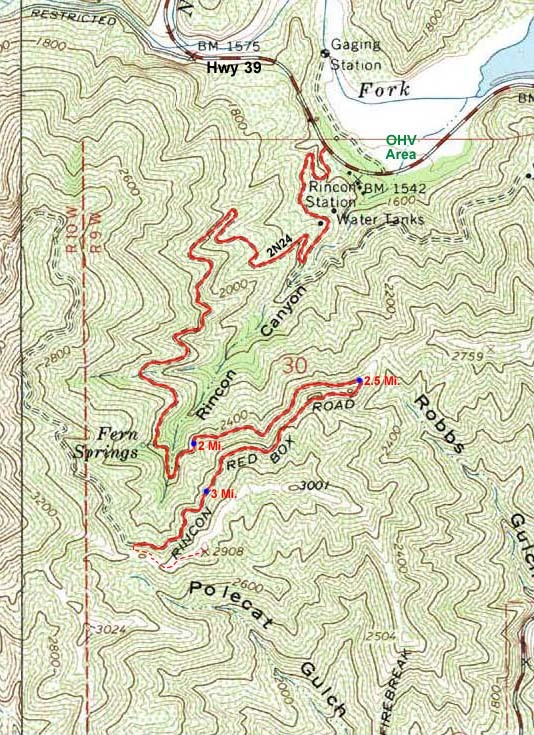 Road Name: The USGS Topo map calls the road "Rincon Red Box Road." It is also commonly called "Red Box Rincon Road." Both expressions are variously punctuated with hyphens and slashes. 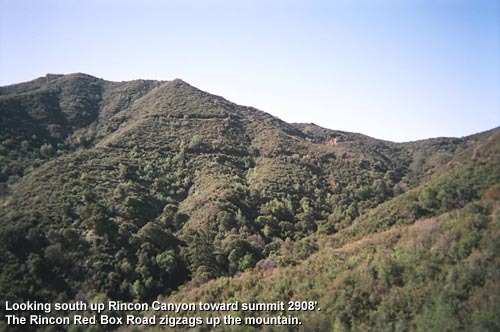 The Forest Service calls it Rincon-Red Box Road (2N24). "Redbox" refers to Red Box junction on the west end of the road intersecting with the Angeles Crest Highway (Hwy 2) near Mt. Wilson. 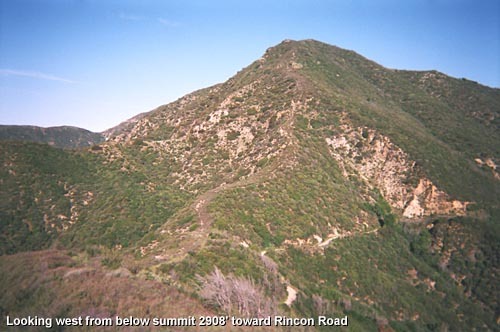 "Rincon" refers to the old Rincon Ranger Station on the east end of the road intersecting San Gabriel Canyon Road (Hwy 39). The west end of the road from Red Box Saddle to Shortcut Saddle is closed to vehicular Traffic. 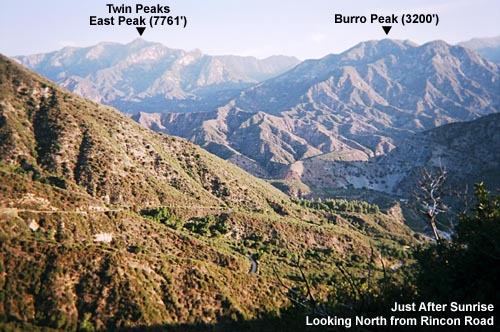 The Forest Service uses the designation Rincon-Shortcut OHV Route to refer to the combination of the eastern section of the Rincon-Redbox Road (2N24) and 2N23, which connects 2N24 to the Angeles Crest Highway at the head of Shortcut Canyon. 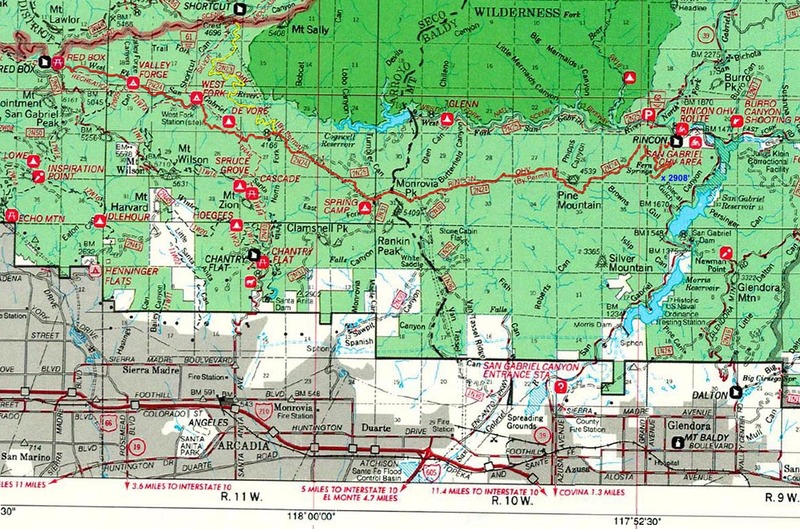 View Forest Service Map (348 K). Closure Note - 7-29-11: For a number of months following the September 2009 Station Fire, this road was in the closure area until early 2011. 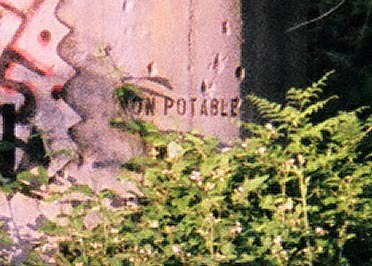 In July 2011 I noticed a sign at the trailhead which reads, "Fire Damaged Area. Closed for safety and natural recovery. No public use behind this sign. Please help this land to recover." According to the Station Fire Closure Area map posted on the FS website, the road is no longer in the closure area. When I spoke with the FS they said the road is open for hiking and biking but no motorized vehicles are allowed. So, ignore the sign and enjoy the trail. Visit the Angeles National Forest website and follow the links to Alerts and Notices. Route Condition to Summit 2908 - Update 7-31-11: The off-road route at the canyon head to the summit was more overgrown since my last visit in April 2007. It still looks passable but long pants would probably be in order. I skipped the summit and continued up the road. This page was last updated April 24, 2016.